But then, they start listening. (I mean, they have drinks on the way, after all; they gotta stay long enough at least to finish those.) So, they listen — a little passively or obligingly at first — and then "This isn't so bad" turns into "Hmm, this is kinda interesting" becomes "This is really different" and "Where can we get your record?" "I'm always amazed, especially when tourists stay," notes Angie, "[and] at the end of a concert, when we stop, that people are clapping, and they liked it, and they come up and tell me. Because part of me thinks, 'Wow, this must be really strange to some people.' To me, it seems totally normal, like breathing." That from a young woman who grew up in a lower- to middle-class Mexican-American neighborhood in South Phoenix, listening to Elton John and Boy George and even some country music, railing at the what-seemed-to-her-then-nerdy Tito Puente and Willie Bobo records her parents played at parties, acting out more than her share of rebellion, and taking piano lessons like her brother. "I played the clarinet first, and my brother took piano lessons. So I wanted to take piano lessons," Angie recalls. "He's my older brother, and I wanted to be like him. So we took piano lessons, and I was miserable. I was terrible at it, so I stopped taking piano when I was around thirteen." That changed when trumpeter Fred Forney, a faculty member at nearby Mesa Community College, brought his jazz band to play for Angie's freshman high school class. "I was completely blown away. I had sort of started to get interested in blues music, then they came and played for us, and I was knocked out," recollects Angie. "They played a blues, and they played a standard — stuff that I had never really heard, because I was pretty green. I had just never heard people play music like that." So pop music suddenly took a back seat to hearing more "jazz," aided by local station KJZZ that Angie describes as being "pseudo-fusiony" back then. A bright spot in the programming line-up, however, was Marian McPartland's Piano Jazz that "was the first real way I heard piano," explains Angie. "I was just amazed that she had on all these piano players." She also discovered some jazz records her father had stopped listening to — Dave Brubeck with Paul Desmond, the Modern Jazz Quartet, Miles Davis' Miles Smiles, and even a solo Antonio Carlos Jobim record. Grins Angie, "I went through his stuff, and he was like, 'Yeah, take whatever you want.'" Angie went on to major in jazz at Arizona State and, though she was felt overwhelmed by the classical piano part of the curriculum and didn't learn much about piano playing there, she was enthusiastic about the jazz classes and learned "a lot about harmony and stuff." But it was in her post-college years where Angie really "learned" the music. She credits her constantly stretching style and probing keyboard demeanor to having the opportunity in her late twenties to play (after moving to New York) with some of the same innovators who are featured on Mirror Me. "They are always stretching boundaries," observes Angie, "So, it just became a normal way to do things ... for me." Even in approaching her writing, compositional architecture takes a backseat to writing for — or better, to — the personalities in the group. As Angie puts it, "I'm trying to create environments for what they can do ... to cater to them." "Fresh Hell," [listen] the album's opener, is a prime example of the melding of compositional interpersonal consideration and the improvisational reciprocity the egoless quartet's members provide each other. The piece is chock full of one satisfying and stimulating surprise after another as the band rides a musical vehicle Angie has specially constructed for herself, tenor saxophonist Tony Malaby, bassist Michael Formanek, and drummer Tom Rainey. Angie's pieces stay grounded in the simple, folk melody-like sensibility that was her compositional springboard when she first started writing. It is what perhaps keeps the music accessible even in its most untamed flights of improvisation. "Wisteria" [listen] was an early effort of Angie's counterpoint studies with Paul Caputo. Those studies she says opened another part of her brain. "It's a very natural way of how music tends to happen, tends to fall. It's like teaching yourself how to recognize or how to see those things ... or rather 'hear' those things," she explains. And, like the intertwining plant the piece is named for, the tenor of Tony Malaby (Angie's husband, by the way) and the piano intermingle with each other and the rest of the band. From the more musically aggressive "Tragón" [listen] (where you can almost hear title's "big slob" throwing his weight around) to the more painfully pensive "Thorns" [listen] to more down-home vamp-infused drive of "Ajo Comino," [listen] melodic linearity and rhythmic diversity abound in Angie's music. Each composition sounds thoughtfully, somewhat innocently, even playfully inquisitive. 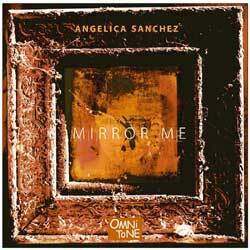 Maybe that's part of the reason why Angie named a piece on the album and the album Mirror Me. [listen] It is surely a musical reflection of this talented young musician and her formidable abilities. But the original impulse behind the title, as Angie believes, was mirroring like "a little kid mirrors you." With that kind of awareness, there's no telling where Angie's inquisitive nature is going to take her or her music — or her audiences — next. Whether it's Olivier Messien or Merle Haggard or maybe even rediscovering an old T Rex record, her music will still get across. As she says, "I think it doesn't matter what the music is; you'll make some type of connection if the music is sincere."